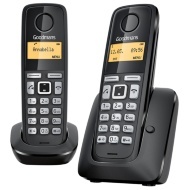 The Goodmans Slimline Phone combines value for money with great design and quality. Featuring a large clear number pad and a 13 number memory, you can quickly and easily make calls to your loved ones. Can be wall mounted for easier access and includes a flashing light to alert you when a call is coming through. Browse more Telephones online, and buy in-store at B&M.